I have to confess that this morning I've been having thoughts... serious thoughts about thermals, awakening Aga's, cosy corners tucked up with a good book, and Duvet days. At this rate, my tribute will be relevant for next summer and not the one that has just left us. but I'm a convert now. It's not too good on my eyes, especially with my intricate ink drawings, but at least I can get an hour or two extra drawing time in before the blurriness begins. So here's the latest update on the butterfly. I apologise for the bad photograph, but it's the best I could do in the light that's available this morning. I even used a lamp too. The winds blowing a hoolie outside, so with the fire roaring I think I'll head back to summer and finish off the butterfly this morning. Because it's Friday, I'm linking up with Eva and Kristin's Paint Party Friday blog... thanks you guys for hosting this great party link. Hey if you like to party too, why not head over there by clicking here. 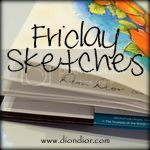 I'm also joining Dion Dior for Friday Sketches too. I know that I've still got lots of peeps to visit this week, but I'll try to pop by soon. In the meantime... woohoo it's Friday so ENJOY! It's finished... well I think it's finished... but I could always tweak a little!